As an avid comic fan, I’m acutely aware of onomatopoeia and how it can be used to enhance a page’s action. More recently, I’ve seen pages with absolutely no sound effects. No “blams” or “kabooms,” just the action. You hear the sound effect in your head, and I barely noticed their absence. I had two versions of this page, and obviously the sound effects won. The action on the page is so fluid and great, as Nic handles motion and fight scenes just as expertly as he does those still moments that FOTB fans should be pretty used to, by now. In the end I went with the effects, because without them it gave off this very (obviously) silent vibe, and that’s not what I wanted to convey. I had a big discussion yesterday about commenting on comics. As you can probably tell, below every comic post is a comments section. We’ve been fortunate to only have thoughtful, complimentary thoughts expressed here so far. But one of the phenomena that I found most interesting was the fact that some readers have an apprehension about commenting; that they feel they’re putting the author out, or intruding on a more engaging conversation. Or worse yet: the author won’t care what they have to say. I won’t spend a lot of time on this, but I’d like to express to any readers that feel this about us: you’re always welcome. I try very hard to respond to every comment we receive, and every email we get. I like reader interaction, whether it’s you guys interacting with each other, or with me. So I’d like to say that comments and discussions are always welcome. And feel free to drop me an email if you have a thought you’d like to share on a personal level. We’re in that infancy stage where I can (and probably will) respond in a good amount of time. I appreciate you reading. I really do. And I know you are! So share your thoughts. It’s safe here. I like most of the fight moves, but the arm break seems a bit unrealistic to me. Not only the general issue that standing locks are generally ineffective against fighters of equal caliber (except as a deterrent or setup), but also specifically that with the palm facing downwards I expect the elbow would bend outwards resulting in a bear hug instead of a break. In order for this to work, the pressure would have to be on the elbow with little room to avoid it, which means the elbow would have to point down and the palm would be pointing up. Instead, given the position and size difference, I was totally expecting a “drop seoinage” judo throw. I mean, she already has such a nice grip on his arm and everything, right? There are many ways for that to end badly for him. Nice background on fighting styles! When writing, I pulled from a smaller-person’s defensive move of separating the attacker’s weapon, and then twisting the arm. I also included more than the standard because I wanted her to go overboard a bit, given her level of frustration and anger just moments before. Hope it didn’t take you out too much! I’m thinking of starting a blog to write about fighting styles, actually. If you want reliable moves that would work for a small person, you can’t go wrong with Judo and Muay Thai. None of this would stop me from enjoying the story, of course. I like the blog idea! Definitely do it. Ohhhh the plot thickens! I wonder what the connection is? I am loving the lady badassery going on in this panel. They make a good team, even if it just might be temporary. Oh, and I so want Avery’s gun with the glowy ring. I’m a big fan of the action in these panels because they fit the characters so well. 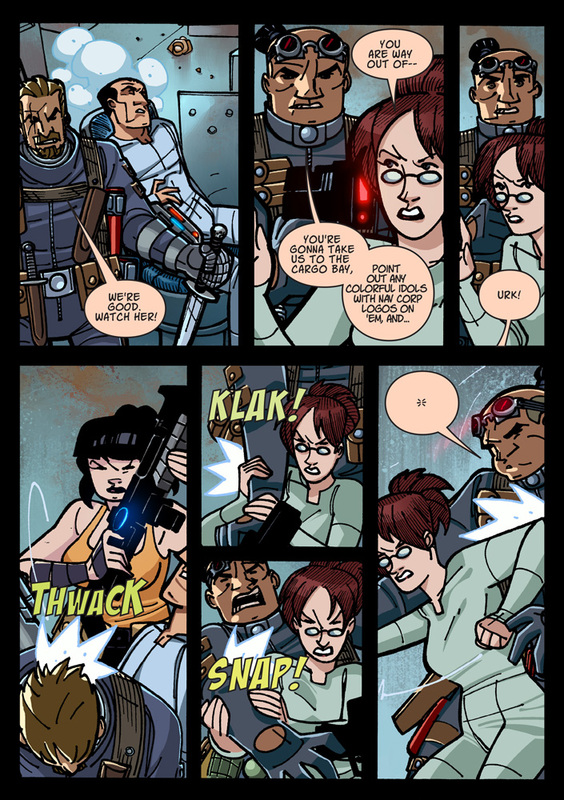 Avery is straight to the point, knocking out the guy with her weapon; blunt and efficient. Sato is methodical about her approach, dropping out of the way of the weapon and rising up with her body to break the guy’s arm, and finally incapacitating him (I think) with a blow to the solar plexus. Btw, may I add that I’m happy to see one of the attackers wielding a knife with a skull on the pommel? COOL! Skull knife is a really awesome detail! I site I found very useful when trying to find sound effects was writtensound.com. It’s not perfect or all encompassing by any means, but it does have a lot of sound effects and examples of where they have been used and etc. Thank you! I didn’t know anything like this existed. I’ll add this to my bookmarks! I’ll say this much, Dan: Reis and Sato DO have a connection to these unsavory fellows… 😉 Thank you for reading and commenting!